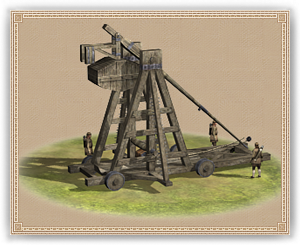 A Siege Works is a large military workshop that is outfitted to produce the mightiest war machinery available, the trebuchet. This impressive structure has everything required to treat wood, create metallic fittings, and see out the entire creative process of any piece of siege equipment. The only artillery that a siege works cannot produce are cannons, which require an entirely different specialist and workshop altogether.